When you decide to renovate a house, you pretty much know that the renovation will include painting just about every single room. 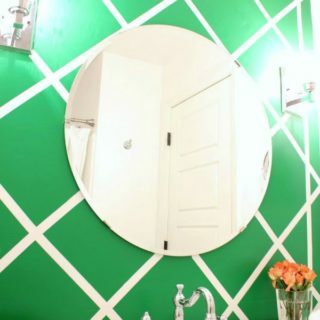 But when you see that house the first couple of times, you are too caught up in the potential to realize just how much painting there is to do – and not just painting of walls, but also of ceilings. And baseboards. And basically all trim. And all doors. Oh and then all cabinets. And that’s when you want to go in a corner and cry and hide and ask yourself why, why, why did we do this to ourselves??? Oh ok, that’s just me. No it’s not. Admit it. You’ve been there or at least been in a similar situation. Every single room, every single door, cabinet, baseboard and piece of trim have to be painted in the 70’s Landing Pad. Now, I wasn’t too concerned about how much time it would take to paint the walls – rolling doesn’t take too long. 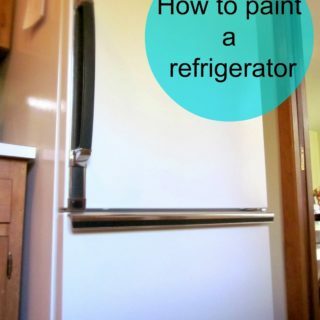 The same was true of the doors and cabinets – I would be able to spray a good portion of those with my paint sprayer. 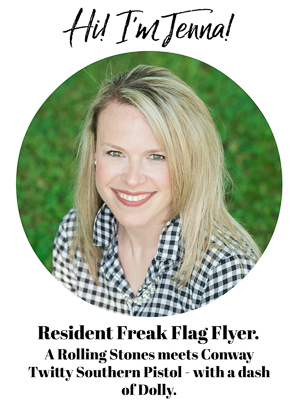 All the trim though – particularly all the miles and miles and miles of baseboards were causing a touch of anxiety. 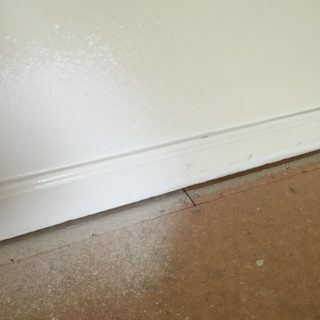 But get this – in the end, it took me about 30 minutes (minus drying time) to paint all the baseboards in the living room, dining room, and hallway of the 70’s Landing Pad. I feel like I should preface posts where I give tons of information like this with “I’m not a professional!” I don’t have a degree in painting furniture, interior design or anything like that. 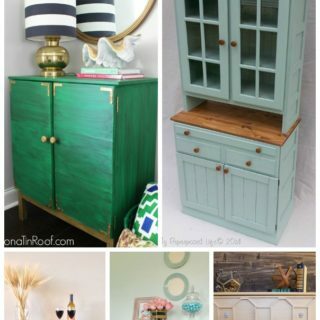 What I do have is nearly a decade’s worth of painting furniture, decorating and things of that nature under my belt…. 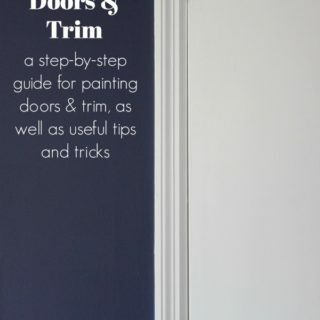 Click the link below to see how to paint doors like this! I can’t begin to tell you how many times I’ve attempted to select a paint color and it has ended in either tears, drinking or both. Throwing of hands in the air, slamming of fists on tables and/or walls is typical as well. 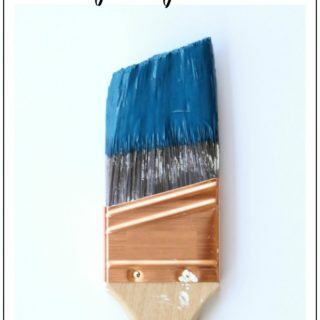 Obviously, buying sample pots of paint and testing those out on your walls is the way to go, but if I bought a sample pot of paint for every color I thought may work, I would have a closet full of sample paint pots. 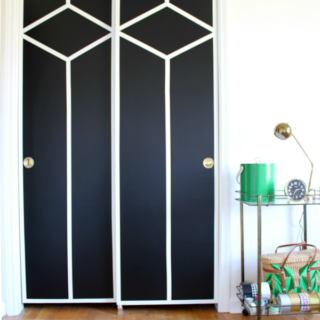 One of my biggest challenges is often coordinating paint colors throughout my house – thus why there is a lot of black and white in my home. 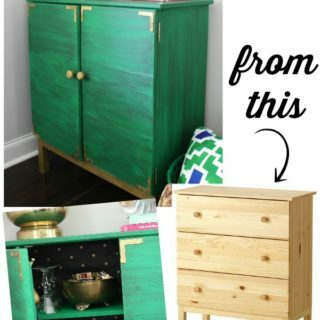 Click the link below to find out about this super easy trick for coordinating paint colors! Show Me Your Grain…Your Wood Grain. 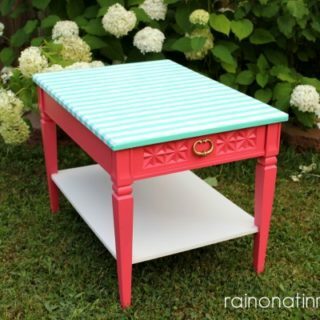 The sight of a beautifully bold painted piece of furniture (preferably either kelly green, navy blue or a bold red) makes my heart soar. Not as much as Grunt Labor makes my heart soar, but pretty close. However, I have come to really appreciate a good grain…a good wood grain that is, because chocolate isn’t a grain yet, is it? I’m still waiting for chocolate to be classified as “good” for me. Click the link below to read the rest and enter the giveaway! Sometimes I try to make things more complicated than they really are. I just don’t think sometimes. Its like my mind sometimes turns off its “common sense” mode. That’s also when I end up saying things I shouldn’t to people. That common sense mode of my brain shut down when I started to do this accent wall. You see I love caned pieces. Caned chairs, caned tables, caned light fixtures. I’m crazy over the pattern. And I have a pillow with a caned pattern on it. And I was determined to get that pattern on my wall. I knew I could. It was just straight lines strategically placed. But I was overthinking it. And it took Grunt Labor coming up to me, turning the pillow diagonally and saying, “Its just squares, Jenna,” for me to figure it out. But I didn’t say that because I’m not too keen on how saying he’s right tastes. Like vinegar, I tell ya. And once this revelation was made, I figured out how to make my own cane inspired wall. 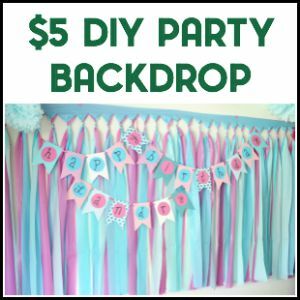 I can’t tell you how many times I’ve ran across DIY headboards on Pinterest. I’m confident DIY headboards could run Pinterest all by themselves. Now, I’m not bashing on DIY headboards at all. If you have patience and an insane amount of upholstery and tufting skills, then by all means make your own headboard. I’m in favor of using what I’ve got. This could also mean that I’m cheap. That’s cool too. I’ll own it. 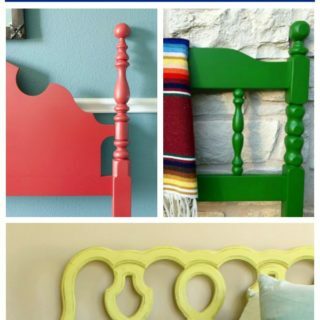 I can paint a headboard faster than I can build one and cheaper too. 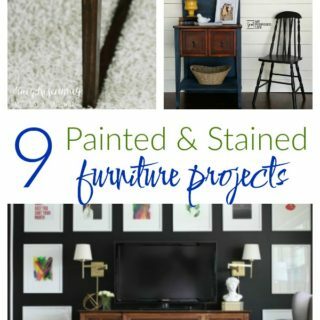 No, it might not look as chic as a velvet upholstered one would, but if it looks like any of these bed makeovers, I wouldn’t turn my nose up at it. 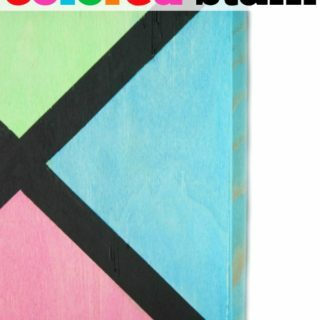 I wanted to see if it would work as a stain too – on unfinished wood. 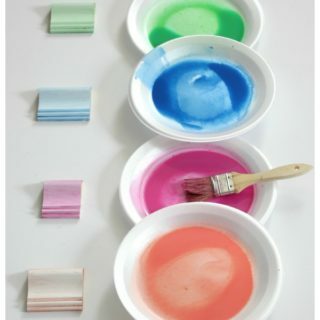 So now you will not only know how to make glazes in any color, but you’ll know how to make colored stain too. Up until last October, I wasn’t a big glazed furniture kind of gal. Glazed donut kind of gal…abso-freakin-lutely….glazed furniture…not so much. But then I used dark glaze on the IKEA Tarva drink bar. At that point, dark glaze and I started to become friends. We experimented. We plotted makeovers. 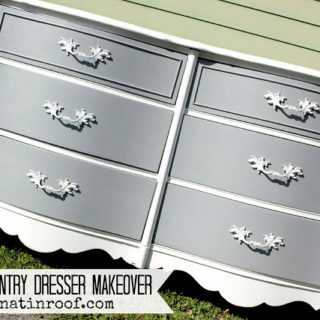 We worked together on a glamorous dresser makeover. Dark glaze and I were skipping happily along off into the sunset…. And then I met clear glaze…. And he swept me off my feet….because he can turn any color into a glaze…. The first few pieces of painted furniture I did, I had no idea what a topcoat was or that I was supposed to use them to seal and protect furniture. I quickly learned that if you paint a piece with a flat sheen of paint, you will eventually wind up with a bruised and scratched up piece of furniture – that ain’t pretty. Not really, those diapers were never great for us. It took a few more tries, but I finally realized the benefit of a topcoat and when to use one. Have you been introduced to my new favorite wall? Its shiny, its gold, its fun, and it was so easy to make. My favorite thing about it? There’s no way you can screw it up. 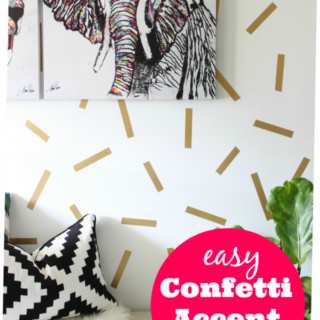 Meet my Confetti Accent Wall. No one ever taught me how to paint walls. I learned how to paint completely by trial and error after my Pap died and I had to paint every wall and ceiling in his house with two coats of primer and two coats of paint. My uncle handed me a five gallon bucket of primer, a five gallon bucket of paint, some rollers and left. My friends and I painted Pap’s entire house over the course of a couple months all while wearing his XXL overalls that we duck taped in the back to hold them up on us. That’s one of my favorite memories and a couple pairs of those overalls are safely tucked away now. 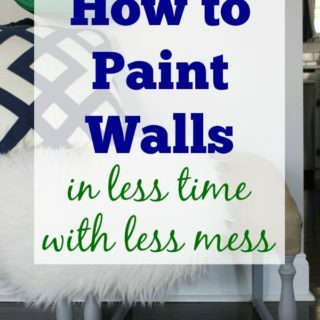 Needless to say, after all that painting and all the painting I’ve done in my other homes, I’ve learned pretty quickly how to paint walls – and how to do it in less time with less mess. 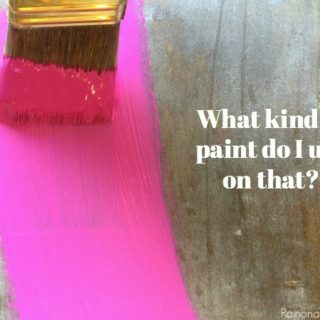 Painting 101: Why is my paint peeling? 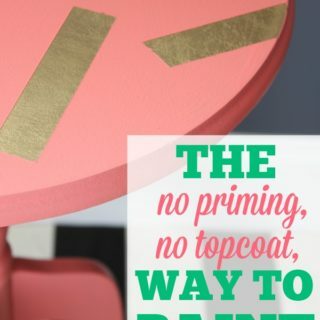 Tips and tricks to keep paint from peeling and scratching off your furniture. If you read the longest blog post in history (a.k.a. 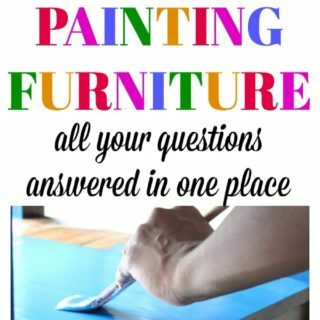 the reader survey results), you know that there were some questions about furniture painting – what finish to use, why is the paint peeling, etc. 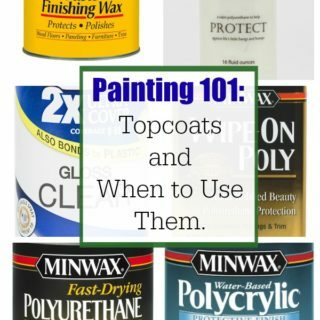 Since I am a woman for the people and cannot let my people down, I decided to start a little Painting 101 series with basic tips and tricks for painting furniture. 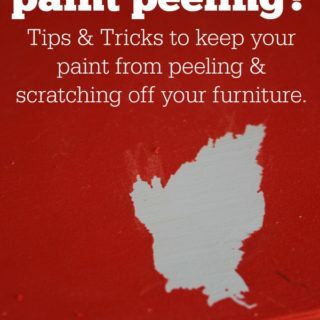 Tips and tricks to keep paint from peeling and scratching off your furniture. 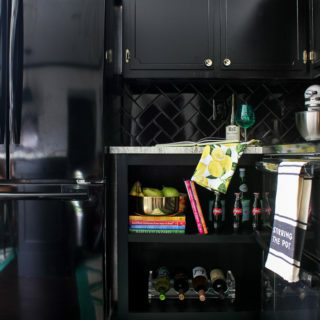 Remember when I turned that IKEA Tarva three drawer dresser into an awesome drink bar? 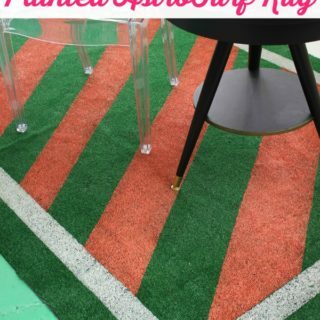 And remember how I mentioned it was part of a challenge presented by HomeRight to five of their bloggers? All five of us ROCKED this challenge. And now, you can vote on whose is the best. And the winner gets $500. And one lucky voter wins a Finish Max Pro (You just have to be a registered user on the HomeRight website to be eligible for winning the Finish Max Pro). Obviously, I would LOVE your vote. All of these girls totally kicked their challenges outta the park. 1. I’m lazy on occasion. 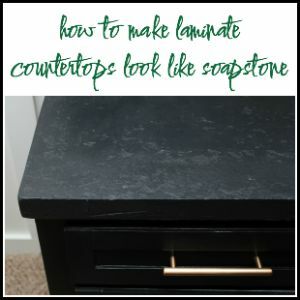 How does this effect my furniture makeovers? I hate having to prime a piece before I can put some glorious color on it. And when the color is finally on, I can barely wait to get the piece back in its place. Oh, but wait….it needs a topcoat. That means I have to wait more. Did I mention I was impatient? Did I also mention I found a solution for this problem? Well, not a solution for being lazy and impatient, but a solution for the priming and top coating. 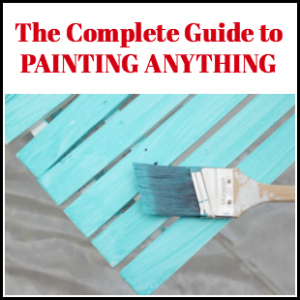 There is a way to paint that requires no priming and no top coating. If you follow me on Facebook, you may remember a month or so back when I posted a picture of an unfinished three drawer chest. They offered to send us one of the IKEA Tarva 3 drawer chests and then have at it.